Tripp Lite's TLP808NETG offers reliable, GREEN surge technology that protects your computer and peripherals, the environment and your wallet. The ECO-SURGE offers a unique Netbook switch that allows users to select wattage, so ECO-SURGE are the only green surge suppressors compatible with all PCs, Notebooks and Netbooks. Energy-saving outlet configuration reduces energy waste (phantom loads) by cutting AC power to unused peripherals. 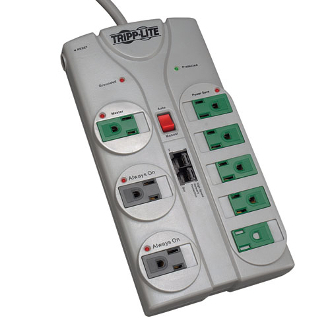 TLP808NETG offers 8 total outlets, 1-line tel/network data line protection, 8 foot cord with space-saving angled plug and diagnostic LEDs to warn of wiring problems and suppressor damage. Network-grade AC suppression rated at 2160 joules shields equipment from surges and line noise. Integrated child-safety outlet covers safely seal off unused outlets. Attractive cool gray suppressor housing with keyhole mounting tabs and 3 designated transformer plug outlets offers convenient protection of desktop computer equipment and accessories. Lifetime warranty with $150,000 connected equipment insurance (USA Only).